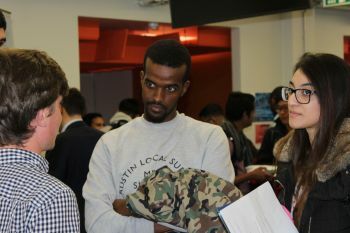 The tech-focused recruitment fair attracted 180 students and over 25 employers. City staged its first ever Tech@City Recruitment Fair on 1st November 2017. Organised by the Department of Computer Science and the Professional Liaison Unit (PLU), the tech-focused fair took place in the Ada Lovelace Room and hosted 25 companies offering placements, internships and graduate jobs. 180 computer science students interacted with the exhibiting tech businesses, including EA Games, National Air Traffic Services (NATS), Royal Bank of Canada, Axis Studios, and Gamma Telecoms. "This was Bontouch's first UK recruitment event and we were aiming to replicate the success of our graduate schemes in Sweden and the US. City didn't disappoint. We had over 70 students sign up and every candidate we spoke to was articulate and demonstrated passion and interest. We are now working through several job applications. Thanks! We will be back!". City prides itself in the fantastic relationships it has fostered over many years with the tech industry. It was lovely to see so many of our placement providers turnout to support our students. Our computer science students showed great enthusiasm in seeking advice and sharing their CVs with employers. We plan to run Tech@City annually and look forward to introducing greater numbers of students to employers in the future.